Candidates has to make Bank Draft of Rs.500/-which is payable at State Bank of India, M.M.M. 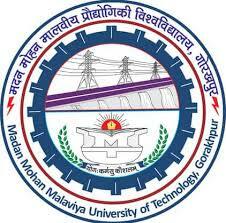 University of Technology Branch (Code No.2578) Gorakhpur, in Registrar, Madan Mohan Malaviya University of Technology, Gorakhpur(125/- is fo ST/SC candidates). Application in the mentioned format should be send to Registrar, Madan Mohan Malaviya University of Technology, Gorakhpur - 273010 (U.P.) before due date i.e. 22/09/2016. See the website of MMMUT Gorakhpur at http://www.mmmut.ac.in/ViewAdvertismentforvaccantposition.aspx for more detail.